For some people, they have never heard of a cord and do not know what to expect when they are buying it. Even if you have ordered a cord in the past, the measurements below will help you put a better image in your head for the word "cord". The measurements are as follows when properly stacked nice and tight. ​4' Tall x 4' Deep x 8' Long. Total of 128 cu inches. Depending on the type of hardwood used, 1 cord of firewood burned for heat, produces the same heat equivalent of 200-250 gallons of oil! According to todays rates 09/09/16, oil is close to $2.00 a gallon. Thats almost $500 dollars for the same equivalent. Oil prices also tend to alter in price a lot more than firewood. How do I know my firewood is seasoned? If you take two pieces of firewood and hit them together it should make a distinctive "clink" noise. Very well-seasoned firewood will have darkened ends (Grey-ish) with visible cracks in the piece of wood. 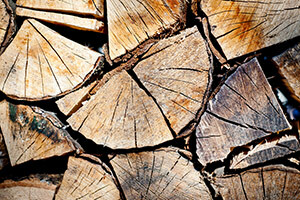 If you try and burn the firewood and it makes a "hissing" sound and bubbles steam out of the end of the firewood, that means the firewood you are using is too wet and needs to be seasoned longer.